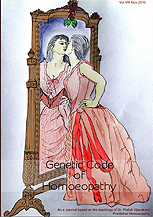 'Genetic Code of Homoeopathy’ is an Organon based journal. It is based on the concepts developed by Dr. Prafull Vijayakar over the past 35 years of clinical practice. It explains the genius of Dr Hahnemann’s work in the light of today’s scientific and modern discoveries.